Need to access your sales reports but forgot or didn't have time to go to the office? Need to access your sales reports but forgot or didn’t have time to go to the office? Forgot to pull out a sales report before a client visit. Running out of time to stop by the office to analyse your sales reports before a client visit. What to do? Arrive late to the shedule meeting? Cancel the visit? When we plan a client visit, we should be informed. Who is the client and what it is history? Which products this client usually purchases? When was his last order? How is the current account of the client? With an overview of the sales reports we have access to all these questions. And for this reason the sales report is an essential tool of management and communication with your client. When we don’t have this informations we are missing an opportunity of communication and probably of closing a sales deal. So when one of the two situations above happens, we know that we are facing a problem. How can we change this ? Have you ever thought on the possibility of having access to your sales report on a mobile application? Well that is possible! 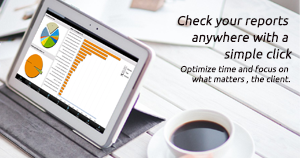 With kstore, you can access to your sales reports on real time anywhere. kstore is a tablet application for Android,Windows or IOS that connected with your ERP system allows you to access what you need on a simple click. You have access what you need when you need. You are prepared to close a deal at any time. You stop worry about carrying on a pill of reports whenever you have a client visit. You show to your clients that you are aware of all relevant information. You focused more on building a relationship with your client. You optimize time and improve the performance of your business. What you can do with kstore? See how your sales are going: by year, month, day, client, product and type of product. Have a vision of the evolution of sales by seller and of the overall business. Make sales comparisons of past periods with current periods. See the historical of clients. Analyse the evolution of your goals/budget. Have a vision of the money you collected from clients to deliver to your backoffice. Need more information? kstore is flexible. If you need more information we will give it you. You need, we create. Want to know more information about kstore? Contact us for more information or get access to more exclusive content here. And find more information about kstore.Through a white paper with exclusive content that we have prepared for you. In this white paper we will show you how to use the reports in kstore, what are the main benefits that will bring to your business and why you should use this solution to increase the efficiency and productivity of your sales team. Take this opportunity and do the download.